You could stare at him blankly for a few minutes. You could also try to remember what you learned in that high school calculus class—which never really seemed to come in handy until now. Or, you could whip out your brand, spanking new iPad to reveal... wait! The iPad doesn't have a calculator. Oh, no! What do you do now? Save face and make haste to the App Store, where you can download your very own copy of PCalc. 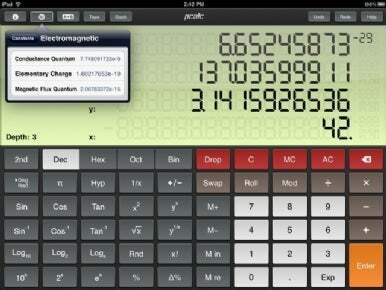 PCalc turns your iPad into a giant calculator. With support for unit conversions, Reverse Polish Notation (RPN) mode, a paper tape, scientific notation, and hexadecimal, octal and binary calculations, there's almost nothing that PCalc—with its appetizingly big buttons and multi-line display—can’t do. For purchasing options, you can download the free, Lite version of PCalc, which allows you to buy only the features you need via in-app purchase, or spend your $10 on the full blown version of PCalc to get the full calculator experience. Both purchases come with a $9 discount coupon for the Mac OS X version of PCalc, so you can keep on calculating on your Mac, too. What fun! Best of all, a purchase for PCalc on the iPad covers PCalc on the iPhone and vice-versa, so you won't have to worry about double dipping—or, hopefully, strange math people—ever again. 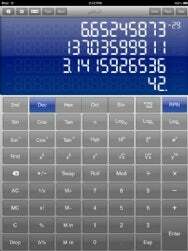 PCalc RPN Calculator requires an iPhone, an iPod Touch with iPhone OS 3.0 or later or an iPad with iPhone OS 3.2 or later.